AURA is the name that Snooper have given to their speed camera database which contains almost 34,000 locations! The AURA speed camera database covers both fixed and mobile speed camera locations including Gatso, Truvelo, SPECS, accident blackspot locations among many others, please scroll down for a full list. Which systems use the AURA database? 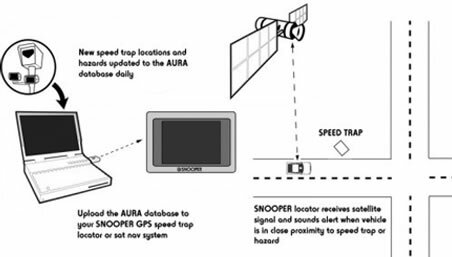 The AURA database is exclusively used in all Snooper satellite navigation and Snooper GPS based speed camera detectors. What's covered in the AURA database? Who maintains the AURA database? Snooper updates and maintains the AURA speed camera database and when a new speed camera appears Snooper say it will be on their database within 48 hours. How does AURA database work? How often can I update the AURA database on my device? Snooper are constantly updating the AURA speed trap database with new speed camera locations and changes to speed limits. So you could in theory update it everyday to be drving with the latest speed camera locations, though once a week is often enough. It's worth remembering a speed camera detector and sat nav with speed camera warnings is ONLY as good as it's last update! Which countries are covered by the AURA database? As well as the UK and Ireland, the AURA speed trap database now provides Worldwide speed camera coverage. Included in the AURA database are locations in Australia, Austria, Belgium, Bulgaria, Canada, Denmark, Finland, France, Germany, Italy, Luxembourg, Netherlands, New Zealand, Norway, Poland, Portugal, Romania, Russia, South Africa, Spain, Sweden, Switzerland and USA and is still growing. 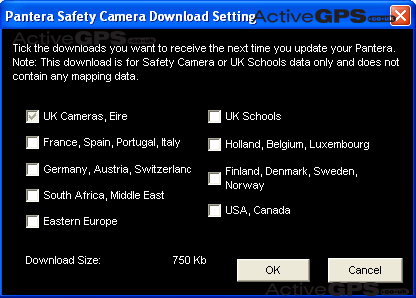 As pictured right, when you install the Snooper download software on your PC, you're asked which countries speed camera location and UK school data you'd also like to include on the download. The Snooper AURA database costs £2.99 a month, £7.99 a quarter or £29.99 a year with a minimum subscription period of 12 months. Though some systems like the Snooper MY-SPEED AURA speed camera detector currently offer the AURA speed camera database subscription free. Do you have a question about the Snooper AURA speed camera database or a question about speed camera detectors? Ask it via the frequently asked questions webpage. Q. My Snooper used to alert to cameras on either side of the road (using the Logic modes) and now alerts to camera on both sides of the road, why is this? A. Performance Products Ltd manufacturer of the Snooper range, have confirmed that following a firmware update ALL devices will no longer provide directional alerts, but will now alert to cameras sited on both sides of the road. This change is a result of customer feedback (see below) and a new EU ruling regarding alerts to speed camera locations in mainland Europe - particularly for France. Snooper devices don't just cover UK cameras, but countries throughout Europe and many countries around the world. Snooper's Action: Simplified alert to cameras on both carriageways. Read more about this and other changes to Snooper devices.